MANILA, Philippines 31 July 2018 – The newest primetime Norse mythology-based fantaserye premiered last night signifying the comeback of the Pambansang Bae Alden Richards (@aldenrichards02) on GMA Primetime. Fans gathered on Twitter to know #WhatsHappening and expressed their all-out support on Alden’s first solo teleserye with 1.3 Million Tweets. 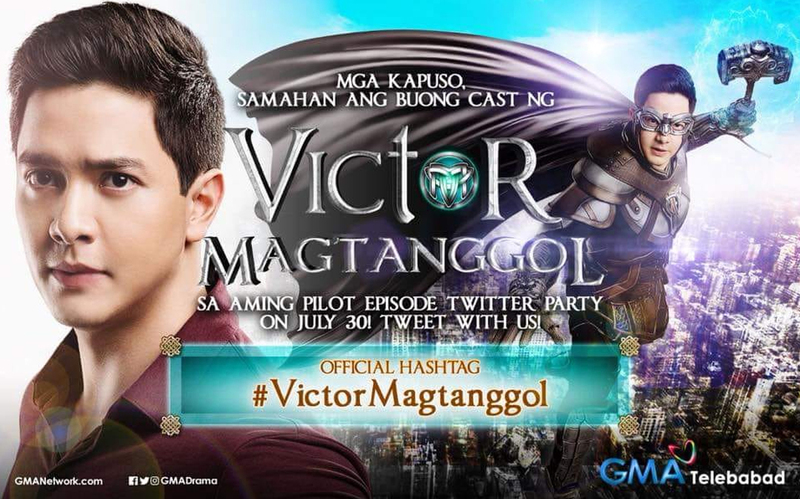 From the announcement until #VictorMagtanggolAngSimula pilot episode, Fans celebrate his major breakthrough in Alden’s career by counting down on Twitter and setting a Premiere Viewing party. While the GMA’s new fantasy show takes its viewers to the greater heights of their viewing habit. The show has also stirred controversy and has been slammed by netizens upon the announcement of the show, and then once again after the release of its trailer, pointing out the many similarities between #VictorMagtanggol and Marvel’s Thor. The problem is not that Victor Magtanggol is unoriginal. The problem is that it has decided to reboot a story that has been done so very well elsewhere. By doing so, it has brought upon itself the unnecessary comparison and the inevitable disappointment. Yeah, as if anyone would care about a flying hammer named “Mjolnir” if Marvel Studios’ Thor movies weren’t released. Face it, Victor Magtanggol is a rip-off. The Pambansang Bae Alden Richards (@aldenrichards02) gave a sneak peak on who is Victor Magtanggol and the Hammerman costume that features his action-packed scenes in the teleserye. He is also hopeful of the continuous success of the show from the grand pilot episode. The telerseye is star-studded with the comeback of veteran stars, Coney Reyes (@conniereyes) as Vivienne who is the mother of Victor Magtanggol and Freddie Webb as Renato Regalado the father of an ambitious and hungry for power politician, Hector Regalado played by Eric Quizon. On its pilot episode, a brief flashback was shown in Asgard showcasing the battle of Thor who is played by “The Mountain” of Game of Thrones, Conan Stevens (@conanstevens) and his rival with his brother, Loki who is played by John Estrada. In addition to Thor and Loki’s battle scene, the viewers also had the chance to see Victor Magtanggol in action, as he ran after a thief to retrieve an old lady’s wallet. The show also highlighted the life of Victor Magtanggol as an Overseas Filipino Worker abroad. He showed how Filipinos worked really hard to help their family in the Philippines. To me, #VictorMagtanggolAngSimula is so relatable because @aldenrichards02 will not only portray a superhero but will also portray a Bagong Bayani who is a person working hard as an OFW for the love of his family and for his country. RT if you know a Bagong Bayani OFW. Salute! Despite the backlash, #VictorMagtanggol still received praise among the netizens because of its stunning special effects and graphics. With all the investments and preparations, this is truly a project worthy of our time and attention! Even some Kapuso stars, the EB Dabarkads and Maine Mendoza (@mainedcm) support Alden’s new project as she copied Victor Magtanggol’s actions. One of Alden’s co-star, Chynna Ortaleza (@ChynsOrtaleza) who played as Lynette Magtanggol, Victor’s elder sister, thanked everyone for watching the pilot episode. AlDub fans did not fail to dominate Twitter as they expressed their support for the King of AlDub Nation, Alden on his solo project. However, some fans were dismayed that Maine Mendoza (@mainedcm) was not joining Alden in this series. It is indeed a most-anticipated fantaserye that people should watch out. The show airs at 7:45 PM Mondays to Fridays after 24 Oras. Be sure to be updated on #WhatsHappening by joining the conversation on Twitter using #VictorMagtanggol. Twitter is what’s happening in the world and what people are talking about right now. From breaking news and entertainment to sports, politics, and everyday interests, see every side of the story. Join the open conversation. Watch live streaming events. Available in more than 40 languages around the world, the service can be accessed via twitter.com, an array of mobile devices, Twitter Lite (mobile.twitter.com), and SMS. For more information, please visit about.twitter.com, follow @Twitter and @TwitterPH, and download both the Twitter and Periscope apps at twitter.com/download and periscope.tv.